Company Overview - Guangzhou Zhaoying Hardware Co., Ltd.
2YRSGuangzhou Zhaoying Hardware Co., Ltd.
Guangzhou Zhaoying Hardware Co. Ltd was established in 1997. Being the the first shisha manufacturer in China, we started research and manufacture shisha in 2002 . With more than 10 years' of hard work, we are now one of the largest shisha manufacturers in P.R. China and well-known in global shisha market. With great effort in product design and invention over the past decade, we have registered 8 patents of new techniques. Now we have thousands of shisha models. In order to meet different needs of customers, we have designed a complete product portforlio. 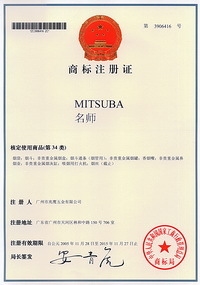 Our main brand, Mitsuba, is targeted for the high end market and always up front in the trend of the world's shisha market. The other brands Habibi and Sahlam offer good quality shisha at reasonable prices to customers of middle and low end market. In order to complete our product chain, we are going to produce Zero Tobacco which contains no nicotine and tar, no harm to human health. Besides shisha and tobacco, we are also selling perfume bottles. As gifts or giveaway, they are also loved by our customers. We manufacture our own products. Our factory in Zhongshan, Guangdong province covers an area of 30,000 square meters. We have shisha processing techniques and machineries to do Jade processing, punching, spinning, die-casting, electroplating, jointing, bottle surface processing, wood processing, spray-painting and tailor-make to different needs for our customers. With these machineries and know-how, we are capable of making more than 30,000,000 US Dollars of shisha every year. Babilon shishas are made by our branch in Yiwu, Zhejiang province. We also have factory and sales office there. To know more about Babilon shisha, please visit : www.babilon-shisha.cnWe always emphasize on product quality. 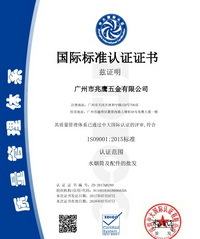 In 2006 we passed ISO9001 Quality Management System Certification by Elvis Enterprises of America. We carry out strict quality control and examination for products throughout the whole production.Nowadays, our shishas are all over the world. You can see people enjoying Mitsuba shisha at home, in the office, in the coffee shops, on the streets and in the cars. With Mitsuba shisha, you can enjoy life any time any where ! Design, manufacture and sales of hookahs and accessories, and daily use hardware products. 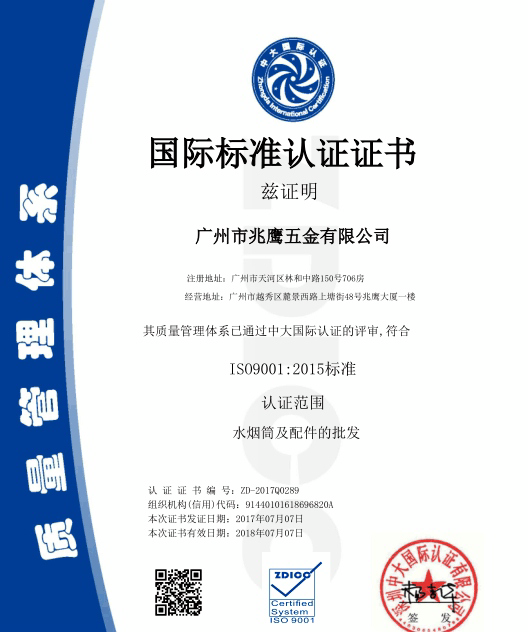 Shenzhen Zhongda International Certification Co.,Ltd.